Portuguese wedding dress designer, Gio Rodrigues, is characterized by sophistication, elegance and sensuality. The 2017 Gio Rodrigues Collection is eclectic: ladies who dream of a romantic wedding style can find a traditional princess cut, and those looking for something more sensual can choose from bolder dresses. To achieve such variety in this new collection, designers at Gio Rodrigues have selected high quality chiffon, muslin, silk, crepe, lace, brocade and crystal embroidered tulle. The use of natural fabrics ensures that the dresses feel all the more luxurious. Enjoy the quality and attention to detail that all of these dresses provide, and choose the one that most suits your style. 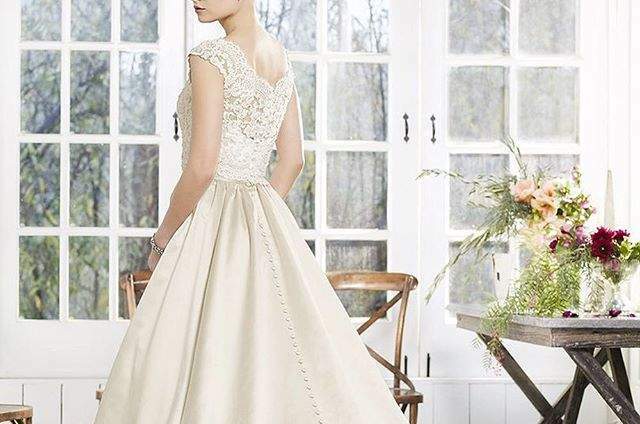 For your big day, you deserve to choose something in which you can feel comfortable, beautiful and perfect. If you want something more personalized and unique, then a Gio Rodrigues designer can create one for you! As well as timeless dresses that are both romantic and traditional, other Gio Rodrigues designs are pioneering in their contemporary orginality and your wedding is the day to make your fashion statement, so go for it! Why shouldn't a bride rock a jumpsuit or a co-ord? Have a look at our favourite designs from Gio Rodrigues in the gallery above.